The days of sacrificing capabilities for a deployable field solution are over. 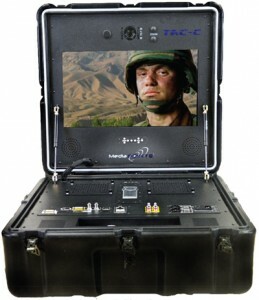 The MediaPOINTE TAC-C incorporates state-of-the-art HD video conferencing, multipoint capabilities, and true AES-256 encryption into a portable, ruggedized, and weatherproof package. With its unparalleled internal A/V system and I/O capabilities, the TAC-C will support external cameras and A/V systems or operate as a fully standalone solution. And with available m﻿obile Wi-Fi, you can be in contact anytime . . . anywhere!